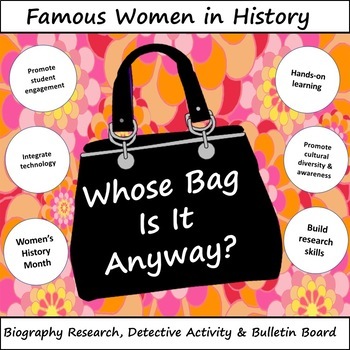 Famous Women in History Biography Research Activity - Whose Bag is it Anyway? This resource will give you a new fun twist on biography research for Women's History! 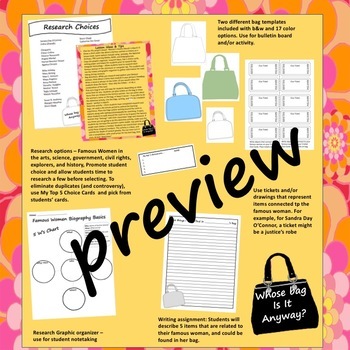 This pack gives you everything you need for research, a connected detective activity, and a student-driven bulletin board. Whose bag is it Anyway> was designed to promote student engagement and integrate technology. Perfect for the classroom, media center, enrichment, STEM, or computer lab! Students will gather valuable biographical information anf research skills while collecting "clues" about famous women in the arts, science, government, exploration, and history. The clues are used to fill the bags - and their classmates will have to guess whose bag it belongs to! Included are lesson ideas and tips, note-taking graphic organizer, writing sheet, famous women choices handout, clue tickets, and bag templates. The writing and bag, along with a bulletin board sign will be perfect for Women's History Month in March, or anytime of the year. Women choices are geared for upper elementary - middle school. So many times. our students study the same famous women year after year - this list will expose them to some new heroes to learn about - from various cultural backgrounds.